Respected Occupational Therapist Adam Ferry, in conjunction with Abacus, will be delivering an invaluable educational bathing seminar at OTAC Leeds alongside the debuting Gemini 2000 platform bath. OTAC Leeds, Weetwood Hall Estate & Conference Centre, Otley Road, Leeds. LS16 5PS. 24th April 2019, 9am – 4pm. Stand 02. Regional OTAC events provide professionals with access to the latest products and information regarding housing adaptations. 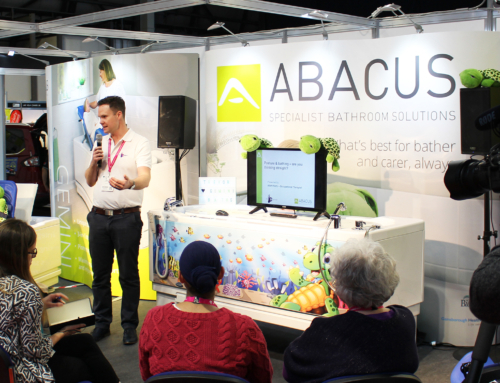 The latest conference in Leeds will deliver a CPD-accredited educational programme which will feature OT Adam Ferry, in association with Abacus Specialist Bathroom Solutions. Adam’s presentation entitled: ‘A client-centred approach to bathing’ highlights clinical and legislative evidence to support bath justification and funding. Delegates will be able to discuss the wellbeing-related and safety benefits of bathing verses adapted showering, as well as the benefits to OTs of prescribing a specialist bath for clients. This seminar is part of the ongoing educational programme from Abacus which provides free training for professionals. 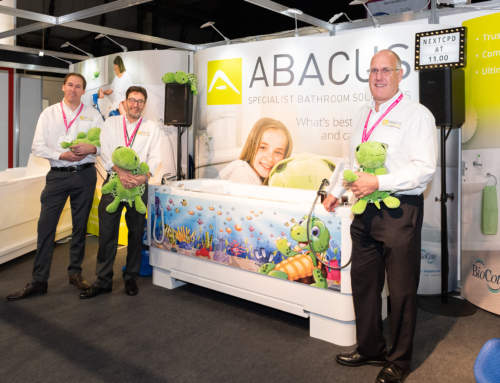 Adam Ferry and Kate Sheehan, senior therapists from The OT Service, partner with Abacus to deliver its nationwide series of CPD-accredited bathing workshops and ‘Lunch and Learn’ seminars. In conjunction with Adam’s latest presentation at OTAC, Abacus will be demonstrating the larger and longer Gemini 2000 bath on stand 2. The new Gemini 2000 is the largest accessible bath available on the market for disabled bathers. Building on the success of the Gemini 1700, it encompasses unique dual lift functionality to protect carers from back injury and an integrated platform for safer transfers. As the changing and drying process is more efficient, bathers can remain warmer and more comfortable – resulting in a better bathing experience. With a length of two metres it provides a complete future-proofed solution for both paediatric and adult bathers. Its pioneering design is enhanced by the inclusion of antimicrobial BioCote technology for advanced infection control. BioCote is proven to provide 99.9% 24/7 protection against harmful microbes such as Influenza H1N1, E.coli, Salmonella and antibiotic resistant MRSA. Integrated during the manufacturing process, invisible silver-ion BioCote cannot be wiped or worn away and is considerably more effective than liquid disinfectants.